Thank you very much. Melania and I are honored to welcome President Moon of South Korea and his lovely wife Madam Kim to the White House. Mr. President, let me be the first to congratulate you on your election, tremendous election people, and also people of South Korea for providing such an incredible example of democracy for the world to see. It was very exciting I must see and congratulations. This morning President Moon and Vice President Pence laid a wreath at the Korean War Veterans Memorial to commemorate the 67th anniversary of the Korean War. It's a beautiful ceremony. We will never forget that Americans and Koreans bravely fought and died together for a free Korea. To the Korean and American veterans of that war, great people, we are eternally grateful for your service and for your sacrifice. More than six decades after our partnership was forged in the fires of war, the alliance between the US and South Korea is the cornerstone of peace and security of a very very dangerous part of the world. The link between our countries cemented in battle is now also tied together by culture commerce and common values. Together we are facing the reckless and brutal regime of North Korea. The nuclear and ballistic missile programs of that regime require a determined response. The North Korean dictatorship has no regard for the safety and security of its people or its neighbors and has no respect for human life -- and that's been proven over and over again. Millions of North Korea's own citizens have suffered and starved to death. on the tragedy of Otto's death. Our thoughts and our prayers remain with his wonderful family. The era of strategic patience with the North Korean regime has failed. Many years and it has failed. And frankly, that patience is over. We're working closely with South Korea and Japan as well as partners around the world on a range of diplomatic security and economic measures to protect our allies and our own citizens from this menace known as North Korea. The US calls on other regional powers and all responsible nations to join us in implementing sanctions and demanding that the North Korean regime choose a better path and do it quickly and a different future for its long-suffering people. Our goal is peace, stability, and prosperity for the region. But the US will defend itself. Always will defend itself. Always. And we will always defend our allies. As part of that commitment, we are working together to ensure fair burden sharing in support of the US military presence in South Korea. Burden sharing is a very important factor. A factor that is becoming more and more prevalent, certainly in this administration. We are also working to create a fair and reciprocal economic relationship. For when the US-Korea trade deal was signed in 2011 to 2016, you know who signed it, you know who wanted it. Our trade deficit with South Korea has increased by more than 11 billion dollars. Not exactly a great deal. I was gratified to learn about the new investments South Korean companies are making in the US. This month, Cheniere is sending its first shipment of American liquefied natural gas to South Korea in a deal worth more than 25 billion dollars. It's great. We will do more to remove barriers to reciprocal trade and market access. We talked last night and today about some tough trade issues. Like autos and steel. And I'm encouraged by President Moon's assurances that he will work to create a level playing field so that American workers and business and especially automakers can have a fair shake at dealing with South Korea. South Korean companies sell cars in America. American companies should have that same exact privilege on a reciprocal basis, and I'm sure we'll be able to work that out. In addition, I've called on South Korea to stop enabling the export of dumped steel. These would be important steps forward in our trading relationship. Very important steps. They have to be made. Not fair to the American workers if they're not and they will be. Our team are going to get to work on these issues. And they're going to sign a deal that's great to South Korea and great to the US. Mr. President, I'm thrilled that you're here today and deeply honored you choose to go to the US as your first foreign trip as President. I greatly enjoyed dinner and the many producitive discussions we've already started having today had today. I look forward to working with you for many years to come to strengthen our alliance, protect our citizens from common threats, and deepen the enduring bonds of friendship, between Americans and the great people of South Korea. Thank you very much President Moon. Thank you. First of all, I would like to extend my deep appreciation to President Trump for inviting me to the White House and warmly welcoming me. When I was elected as president last month, President Trump was the first foreign leader to extend his congratulations. This was in fact the warmheartedness of the people of the United States to the Korean people who achieved a victory after a rough and difficult journey. It was a message of comfort and encouragement towards a great alliance that has overcome adversity and hardship and walked together a path of freedom and democracy, peace and prosperity. I would like to once again take this opportunity to extend my sincere gratitude to President Trump and the American people. In my first phone conversation with President Trump last May, I felt that he was a bold leader that made pragmatic decisions. I received a very strong impression. And as I exchanged a candid and lengthy conversation with President Trump last evening and this morning, I could confirm that my impression was not wrong. I recognized President Trump’s strong commitment towards the development of the ROK-US alliance, the resolution of the North Korean nuclear issue, and the establishment of a permanent peace on the Korean Peninsula. And we were able to form a broad consensus. Through this visit, President and I have established a deep mutual trust and friendship. I am confident that this will be a sound foundation as we tackle many challenges that lie in front of us. First, President Trump and I agreed that only strong security can make true peace possible. Through the ROK-US joint defense posture, including extended deterrence, we agreed to strengthen our overwhelming deterrence. We also agreed to firmly respond against North Korea’s threat and provocation. North Korea’s nuclear and missile threat is the most serious challenge that the Republic of Korea and the United States face today. President Trump and I agreed today that the resolution of the North Korea nuclear issue is our top foreign policy priority and that we will closely coordinate our policies. In this vein, we agreed to work together toward a fundamental resolution of the North Korea nuclear issue based on a phased and comprehensive approach, utilizing both sanctions and dialogue. North Korea should not underestimate the firm resolution of our two countries to resolve the North Korea nuclear issue under any circumstances. And we urge North Korea to return in the nearest future to the negotiation table for the denuclearization of the Korean Peninsula. There can be no compromise or concession when it comes to national security. 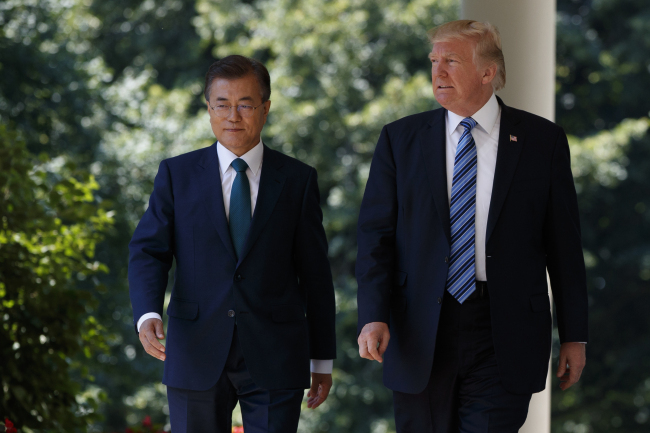 I would like to take this opportunity to highly appreciate the ironclad commitment of the United States and President Trump towards the ROK-US alliance. The Republic of Korea will strengthen the ROK-US joint defense capability and, at the same time enhance the ROK military’s own defense capability through its military reform. In this process, I hope to see more active technology cooperation in the field of defense industry. Second, we shared the view that Korea-US economic cooperation is an important pillar in pursuing a future-oriented development of our alliance. We agreed to work together to make our economic relations mutually beneficial for the people of both our countries through economic growth and job creation. Third, we agreed to expand and develop our alliance into a global partnership, responding side by side to worldwide challenges including terrorism. Going forward, our two countries will establish high-level strategic consultation mechanisms in various fields. The ROK and the US will continue to consult each other in coming up with detailed plans to address these issues. Also, I extend my deepest condolences and sympathies to the bereaved family and the American people who are in deep sorrow at the passing of Mr. Otto Warmbier. The raison d’être of a nation is to protect its people. I deeply sympathize with the grief of the American people on not being able to protect its citizen. Moreover, as having been a human rights lawyer myself, I understand very well the significance of human rights as the most fundamental and universal value. Our two countries will cooperate together with the international community to improve the human rights situation in North Korea in order to prevent this kind of tragedy from occurring again. I invited President Trump to visit my country within this year, and President Trump gladly accepted my offer. The visit of President Trump and the first lady will be a testament to our deep and everlasting friendship between the people of our two countries. I will make all the preparation necessary to make sure that the visit will be yet another milestone in the cooperative relationship of our two countries. Once again, I would like to express my deepest gratitude to President Trump and the First Lady for their warm hospitality. Thank you very much.